غفاری سرجامی, علی, ده باشی, محمدحسن. (1397). انتخاب روش حفاری تونل، به‌کمک "فرآیند تحلیل شبکه‌ای" با‌رویکرد زیست‌محیطی (مطالعه موردی: خط‌2 متروی مشهد). 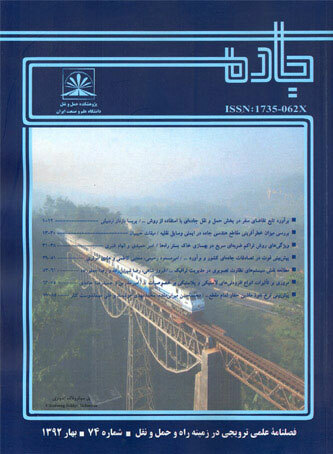 جاده, 26(97), 77-95. علی غفاری سرجامی; محمدحسن ده باشی. "انتخاب روش حفاری تونل، به‌کمک "فرآیند تحلیل شبکه‌ای" با‌رویکرد زیست‌محیطی (مطالعه موردی: خط‌2 متروی مشهد)". جاده, 26, 97, 1397, 77-95. غفاری سرجامی, علی, ده باشی, محمدحسن. (1397). 'انتخاب روش حفاری تونل، به‌کمک "فرآیند تحلیل شبکه‌ای" با‌رویکرد زیست‌محیطی (مطالعه موردی: خط‌2 متروی مشهد)', جاده, 26(97), pp. 77-95. غفاری سرجامی, علی, ده باشی, محمدحسن. انتخاب روش حفاری تونل، به‌کمک "فرآیند تحلیل شبکه‌ای" با‌رویکرد زیست‌محیطی (مطالعه موردی: خط‌2 متروی مشهد). جاده, 1397; 26(97): 77-95. می­باشد. در این مقاله سعی شده­است تا با ­استفاده از روش مذکور و با­توجه اساسی به معیارهای زیست­محیطی، اقدام به انتخاب تکنولوژی حفاری از­میان سه­گزینه کند و پوش (Cut & Cover)، روش جدید تونل­زنی اتریشی (NATM) و دستگاه حفاری تونل (TBM)، جهت مطالعه خط دو متروی مشهد صورت پذیرد. نتایج این تجزیه و تحلیل نشانگر این است که روش­های مدیریتی و تصمیم گیری مانند ANP می­توانند با توجه به رویکرد­های مدنظر (مانند محیط زیست)، نتایج منطقی و قابل اطمینانی ارائه دهند. همچنین نتایج نشانگر این است که روش TBM در میان سه روش مذکور دارای ارجحیت بوده و تحت اکثر معیار­ها به جز معیارهای مالی، عملکرد قابل قبولی دارد. -Bobylev Nikolai, (2011), “Comparative analysis of environmental impacts of selected underground Automation in Construction. -Bobylev Nikolai, (2007), “Sustainability and Vulnerability Analysis of Critical Underground Infrastructure”­[Book Section], Managing Critical Infrastructure Risks, Springer Netherlands. -Bobylev Nikolai, (2008), “Urbanization and Environmental Security [Book Section], Environmental Change and Human Security: Recognizing and Acting on Hazard Impacts”, Springer Netherlands. -Cuia Ying, Kishidab Kiyoshi and Kimura (2017), “Makoto Prevention of the ground subsidence by using the foot reinforcement side pile during the shallow overburden tunnel excavation in unconsolidated ground, Tunnelling and Underground Space Technology, Vol. 63. - pp. 194-204. -Honggui Di, Shunhua Zhou, Junhua Xiao, (2016), “Quanmei Gong and Zhe Luo Investigation of the long-term settlement of a cut-and-cover metro tunnel in a soft deposit [Journal] // Engineering Geology. Vol. 204. - pp. 33-40. -Ghodusi Azadeh, (2007), “Eshtehardian Parviz and Bizhanpour Ehsan Introducing a supporting system for choosing hte best provider with the methods AHP and ANP. -Host Mashhad Urban Railway Corporation [Online]. -Li Jingyuan and Yang Tongjin China's Eco, (2015), “city Construction, Springer Berlin Heidelberg”. -Moynihan Gary P. and Jethi J. Rashesh, (1995), “A decision support system for multiatttribute evaluation of automation alternatives, Computers & Industrial Engineering, 1-4 : Vol. 29. - pp. 417–419. -Noritomi You, Yasuhiko Kato and Masatoshi Kitaoka Numerous, (1994), “date in hierarchy for knowledge concentrated in decision tree Computers & Industrial Engineering. 1-4 : Vol. 27, pp. 535–538. -(2012), “OECD OECD Environmental Outlook to 2050 The Consequences of Inaction” - Paris : OECD. -“Özdemir Levent North American Tunneling” (2006), Washington, DC: Taylor & Francis, Washington, D.C.
-Repetto L. and Fidelibus C., (2016), “Decision Plots for preliminary design of single-shield TBMs Engineering Geology”. Vol.5, pp. 134-139. -Saaty Thomas L. and Ozdemir M., (2003), “Negative priorities in the analytic hierarchy process Mathematical and Computer Modelling”. 9-10 : Vol. 37. - pp. 1063–1075. -Saaty Thomas, L., (2005), “Theory and Applications of the Analytic Network Process: Decision Making With Benefits, Opportunities, Costs, and Risks, RWS Publications”. -Saaty Thomas, (2004), “The Analytic Network Process Systems Science and Systems Engineering, Vol. 13. p. 3. -Sedghiani A., Hamedmirjafari M. H. and Mollahasani B., (2008), “The tunnel excavation impact of Mashhad's 2nd metro line on the adjacent structures in different circumstances, 5th national civil engineering congress of Iran.